This loop hike consists of the View Point, 105A, and North Mingus Trails, atop Mingus Mountain, in central Arizona's Black Hills. Awesome views and a wide variety of plant life on this hike provide an enjoyable outdoor experience. Beginning at the Mingus Campground trailhead, the View Point Trail #106 immediately drops off the eastern edge of Mingus Mountain. Leaving the mountain top forest behind, spectacular panoramic views become a hiker's constant companion, as the trail descends along the steep, brushy mountainside. 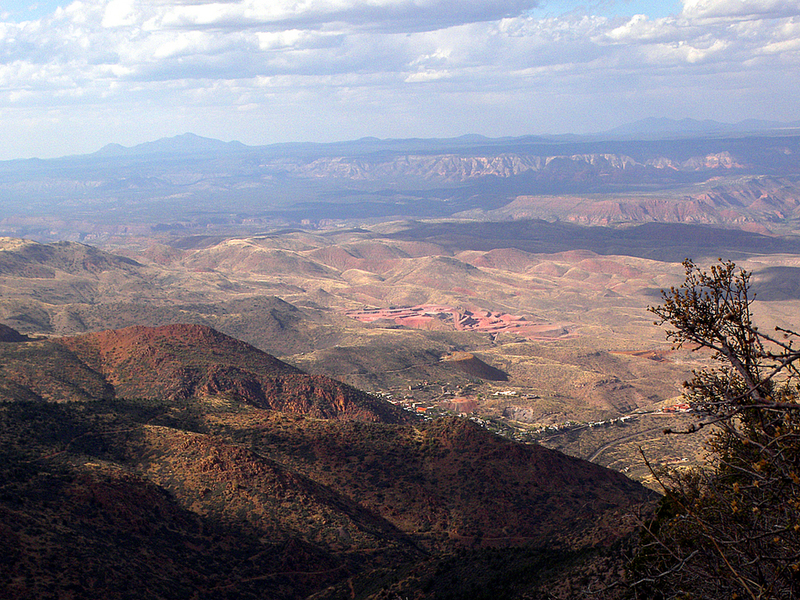 The entire Verde Valley, along with Sedona and the volcanic peaks of the Williams-Flagstaff area, are visible along most of this hike. At the three quarter mile point, the trail levels off somewhat and contours along the 6800 foot level, among pinyon pines, beargrass, and chaparral. The city of Cottonwood lies far below to the east, while dark ledges of basalt guard the top of Mingus Mountain one thousand feet above you to the west. At around 1.6 miles, the View Point Trail reenters forest, and soon arrives at the signed junction with trail 105A at 1.85 miles (34.71048 N, -112.10741 W). Turn west and follow the 105A trail, as it climbs up through prolific gambel oaks and traverses the rugged northeast corner of Mingus Mountain. Trail 105A soon comes to an end in a saddle at the 7000 foot level, where it meets the North Mingus Trail #105 (34.71449 N, -112.11158 W). Woodchute Mountain, and Jerome, clinging to the side of reddish Cleopatra Hill, can now be seen. 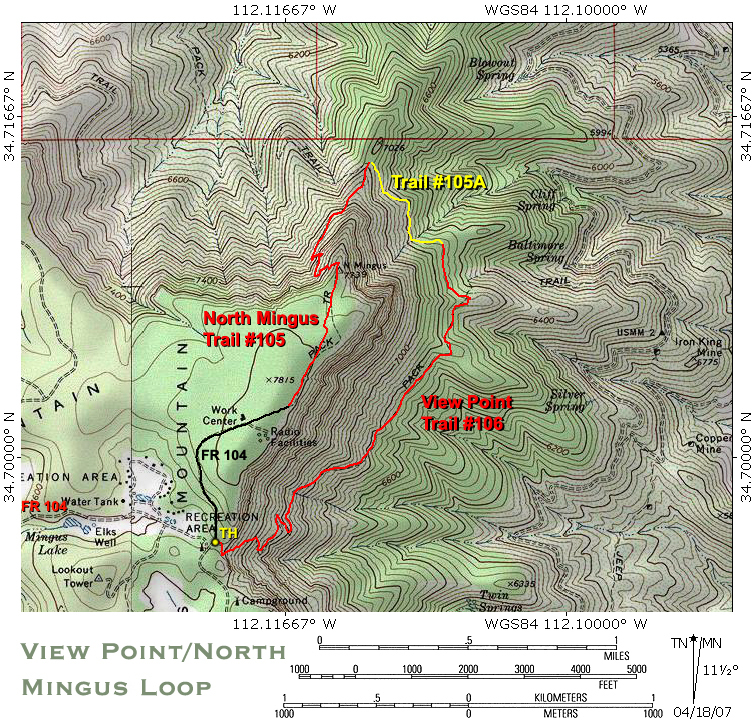 Turn south onto the North Mingus Trail and begin climbing up the narrow, rocky ridge that runs down from the north face of Mingus Mountain. The trail becomes steeper, and encounters some switchbacks, as it enters the beautiful fir forest on Mingus Mountain's north face. Some bigtooth maples and an aspen grove along the trail add to the beauty of this steep-walled, forested bowl. Throw that in with the incredible views of the surrounding area, and you've got one sweet stretch of trail! After a 700 foot climb, the North Mingus Trail reaches the top of Mingus Mountain, and heads south through the forest. About 0.2 miles after hitting the top, the trail arrives at a double rock cairn, where the trail splits (34.70651 N, -112.11435 W). Take the left fork to the east. The North Mingus Trail soon reaches the eastern edge of Mingus Mountain, where the awesome views return. A couple of hang glider launch ramps are passed, before the trail comes to an end at forest road 104 (34.70259 N, -112.11641 W). Head downhill on the road now, past the forest service's Mingus Work Center, and many no camping signs. After 0.7 miles on the road, you will arrive back at the Mingus Campground trailhead. Prescott FS Reports This is one of a number of well-maintained trails serving the Mingus Mountain recreation area and campgrounds. The trails in this area and at these high elevations offer splendid views to the east of the Verde Valley and the Cottonwood area. In the fall this area is especially attractive when the maples and oaks turn to varying shades of red and brown. This is particularly true of the northern and western slopes of Mingus Mountain. The trails in this area offer opportunities for a number of loop trips back to the campground area. Descending on TR #106, the hiker can return to the campground by way of TR #105A and TR #105. Maps, other resources: Prescott National Forest, east half; U.S.G.S. topographic 7.5' quad for Cottonwood. Trail layout: Leaving the campground, the trail descends very steeply for the first 0.75 miles. At about mile 1.35 the trail intersects the TR #105A coming in from the northwest. From here the descent is somewhat more gradual to where it ends on FR 413. Precautions: The initial descent from the campground area may be difficult for horses and should only be attempted by experienced riders. From the Highway 89/Highway 89A junction just north of Prescott, head east on Highway 89A, towards Jerome, for 18.9 miles. At the top of the mountain (milepost 336.6), turn right onto forest road 104, and follow it for 2.5 miles to the Mingus Campground. There is a parking area and trail sign for the View Point Trail #106 on the far east side of the campground.